The city held an open house on Tuesday, Sep. 4, for residents to learn more about what may be ahead. A small group of North Plains residents gathered Tuesday evening, Sept. 4, to learn about the vision for their city's future. North Plains is expecting immense growth over the next couple decades. Recently, Portland State University's Population Research Center conducted a report on the projected growth North Plains will see over the next 20 years. The report projects there will be a 5.1 percent increase in population annually between now and 2038. Now, the city is having to determine how they will work with these numbers, with there being a large deficit of land within North Plains' urban growth boundary to be used for housing and employment needs. Community members got to hear from City Manager Andy Varner, Steve Faust with 3J Consulting, Bill Reid with PNW Economics and Pat Ribellia with PR Land Use Strategies during the open house Tuesday evening on the findings of the report and ask questions about what comes next. The new economic opportunities analysis was created based off the PSU report, with goals of projecting the land that is needed to accommodate future employment, determine if the existing employment land supply is sufficient to accommodate that growth and update the city's economic development policies while meeting state planning requirements, according to development officials. The analysis showed a total employment-designated land need of up to 162 acres, including 80 commercial/retail acres and 82 industrial acres. There is also a need for 1,547 new dwelling units in total, 756 within the current UGB and 791 outside of the current UGB. This equates to needing 82 to 118 acres of additional housing-designated land outside of the current UGB, depending on the density of the housing mix, according to the analysis. "Due to the existing land deficit, North Plains may need to expand its urban growth boundary by up to 280 acres to accommodate housing and employment needs," the EOA stated. And with the projected growth, officials said, the city's economy will need to play "catch-up." "Accordingly, City Council felt it appropriate to plan for an economic base that would complement and serve expected growth rather than become even more intensively a bedroom community with lacking services, including grocery," the EOA stated. The "target industries" for the area include small- and medium-scale manufacturing; warehouse, distribution and wholesale businesses; professional services, including software development and research; services for residents, including a grocery store and more educational and childcare services; more services for seniors, including assisted living and medical care; and services for visitors, including hotels and restaurants, the EOA showed. Using the "Safe Harbor Rule" or planning employment land need by assuming the local economy will grow consistently with the projected population influx, North Plains will need to act on expanding the UGB, officials said. "Just all houses with no services or employment, that's pretty imbalanced, so we are striving to become a well-balanced community," Varner said. "These are exciting times." It won't just be housing and employment the city will need to consider, but also water improvement, transportation improvement, and various other policies and objectives to meet the vision of North Plains. 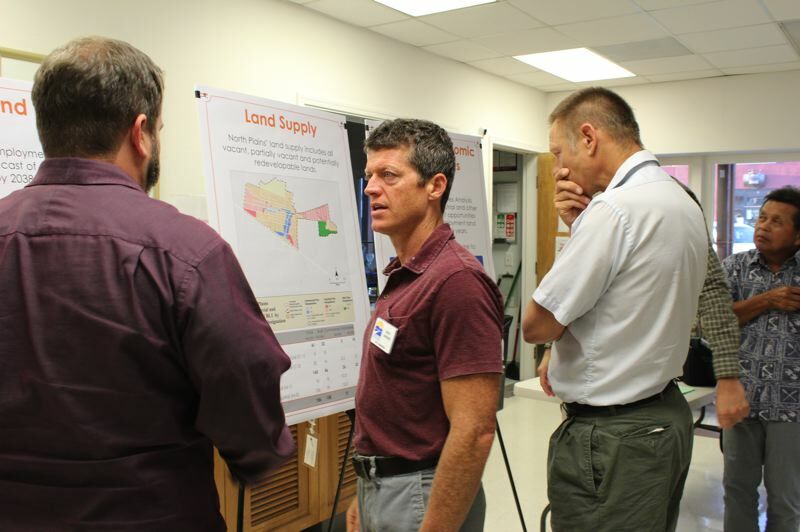 Audience members questioned the implementation of new development, accuracy of numbers and how much say they will have in the planning process during the open house. "How do you grow? How does the city want to grow? Those discussions are forthcoming," Varner answered. "Right now, it's just accepting a report, essentially, but that's going to be the foundation for all those discussions." City Councilor Garth Eimers added, "The numbers are realistic as a projection. How we implement them is still up in the air." This is only the beginning, city officials assured community members Tuesday. The City Council will now need to accept this report in order to meet state mandates, but using these numbers to plan for future development isn't something that will happen overnight. A hearing is scheduled for Monday, Sept. 17, where public comment will be welcomed, and ultimately, a vote made. "I would encourage you to stay engaged, because this is a two- or three-year process to get through this. We need everybody coming to these meetings and staying engaged in the whole thing," said City Councilor Larry Gonzales, who is not running for re-election this fall. "Tell your neighbors, tell your friends … every meeting there is a decision that's made." Gonzales assured the audience, "I'm with you on this. I like North Plains. I don't want to see it go crazy with growth, but I also want to make sure that the people who live here can work close by and have the kind of services that they deserve."